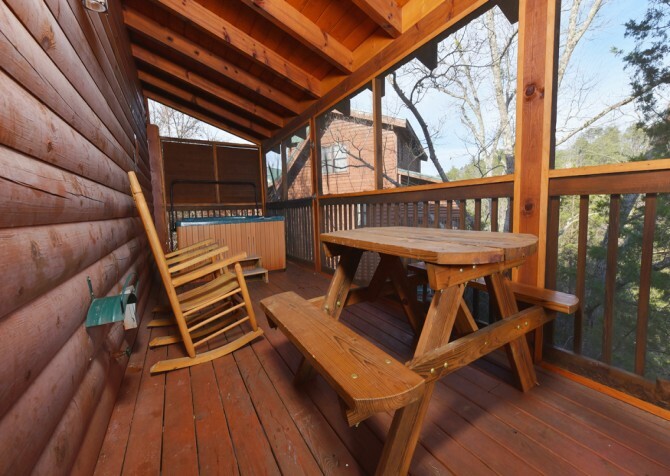 For a charming mountain cabin with modern updates, loads of fun amenities, and space enough to call it a party, check out Mountain Time. 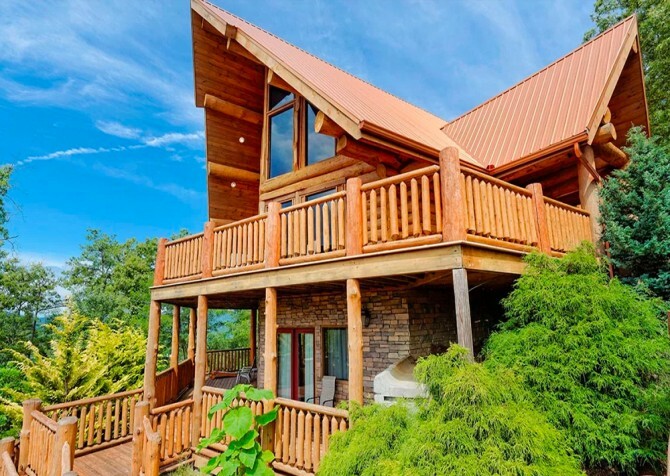 Located less than 3 miles from the excitement of downtown Pigeon Forge, Mountain Time is a 5-bedroom, 5-bath cabin set amongst the Smoky Mountain trees. You and 15 other guests can enjoy a variety of entertaining extras in this cabin, including a theater room with a huge flatscreen TV, a rec room with multiple game tables, and outdoor deck spaces with plenty of seating and an outdoor hot tub to boot. 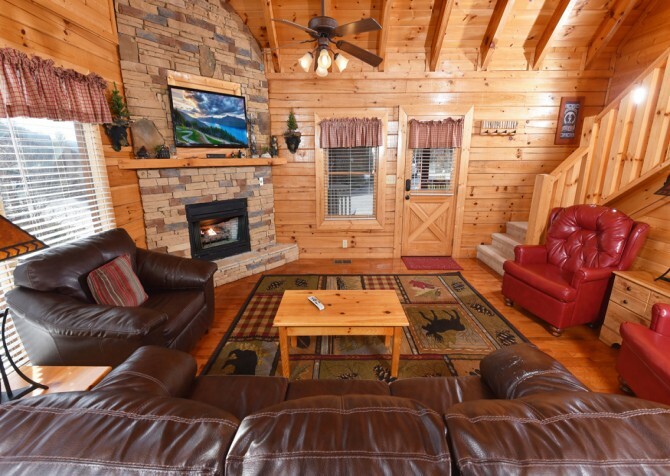 Enjoy all this along with the comfortable living spaces inside Mountain Time for a family getaway or group gathering in the Smokies that’s full of ways to relax and have a great time! 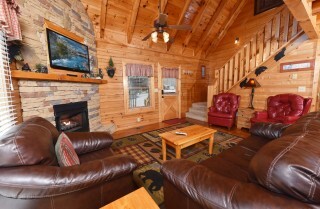 When you step into the Mountain Time living room, you’ll love the high ceilings, walls of windows, and open, airy feel of this Pigeon Forge cabin. 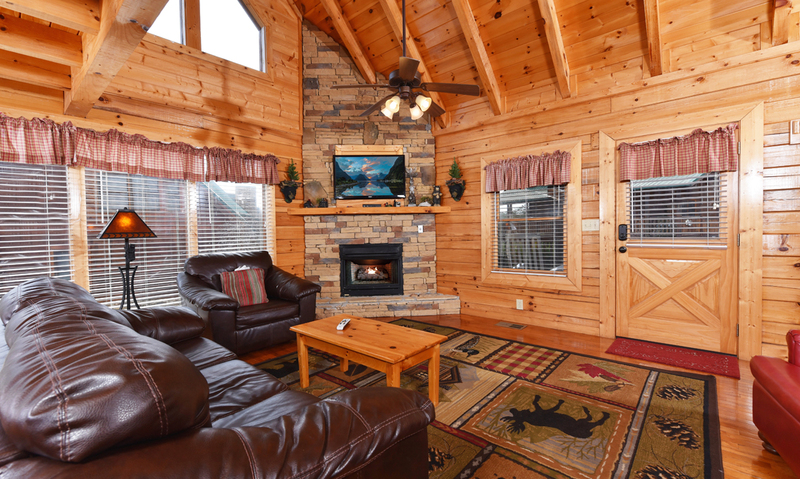 The large, stone fireplace is the focal point of this room—with stones reaching all the way to the ceiling. For seating, you and your guests can enjoy a large leather couch and matching lounge chair, as well as 2 red leather sitting chairs on the opposite side of the room. In the middle, set your drinks out or set up a favorite board game on the coffee table and take advantage of end tables and reading lamps in this space for quiet mornings with your favorite book. 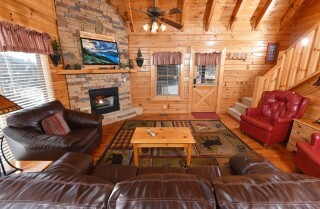 You can also kick back and enjoy laid-back evenings with your favorite sports team or TV show on the large flatscreen TV mounted above the fireplace. 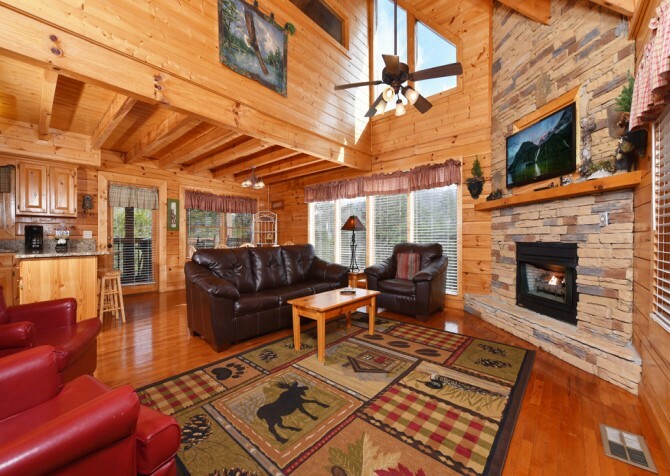 And to complete the Mountain Time living room, enjoy charming accents like window valances, colorful area rugs, and decorative black bears that scream Smoky Mountains. The cozy kitchen of Mountain Time features modern updates like granite countertops, new stainless-steel appliances, and beautiful wood cabinets. 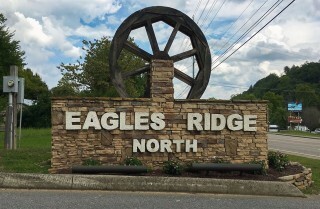 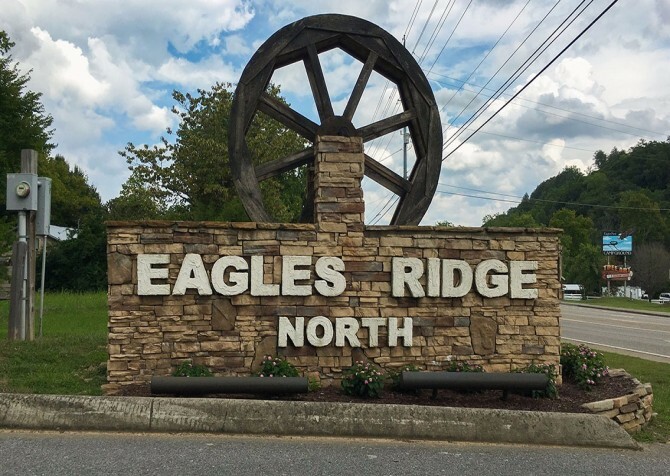 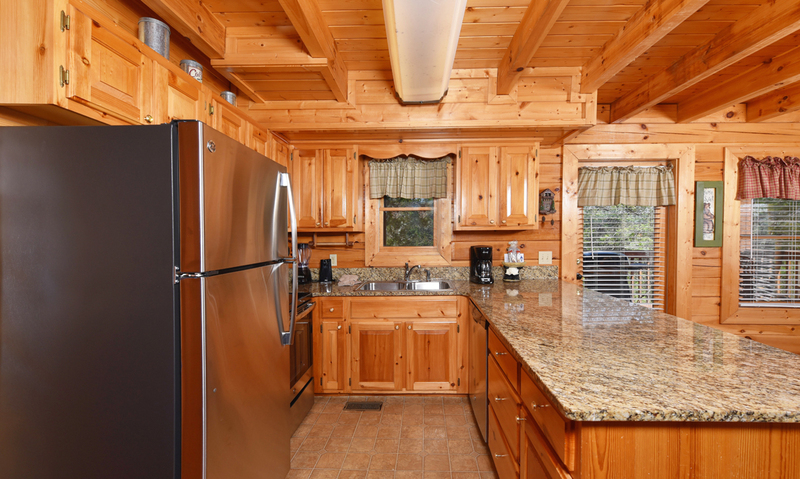 You’ll find all the major appliances you’ll need for your Pigeon Forge getaway as well, including a white refrigerator, a white microwave, and a black and white oven/stove. In the mornings, be sure to take advantage of the coffeemaker and toaster available to you in this cabin. You can easily feed your guests an in-cabin breakfast of bagels and cream cheese or toaster pastries. 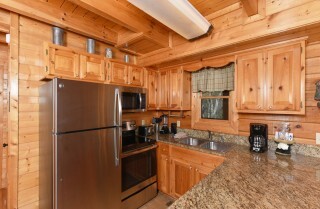 There’s also a blender for the nights you want to mix it up and have a little fun inside Mountain Time. But keep in mind that this cabin is less than 3 miles from the fun of downtown Pigeon Forge and delicious Pigeon Forge restaurants. 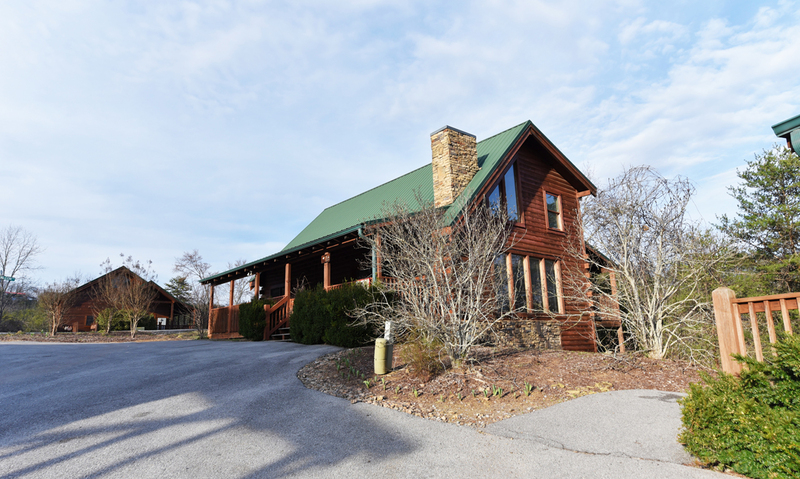 So be sure to venture out when you get the chance and explore all that Pigeon Forge has to offer! For the nights you decide to cook in or take advantage of in-cabin catering services through Cabins For You (see our vacation packages for more details), you’ll find the perfect dining space inside Mountain Time for your group. The 8-piece dining set provides most of your seating, but you will also find a 4-person breakfast bar beside the dining room in the Mountain Time kitchen. If you still need more seating, the open-concept design of this cabin allows for guests to be seated in the living room without feeling cut off from the conversation. 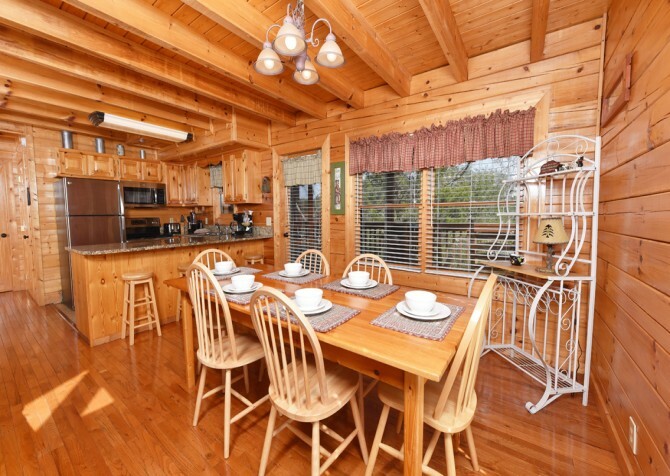 Enjoy the clean wooden design of the Mountain Time dining table, as well as a simple hutch providing country charm in the corner. And one of the best features of this dining space is its airy feel with windows all around. 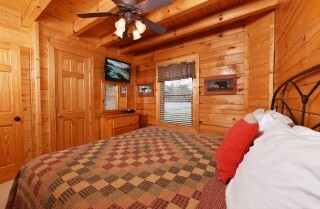 You’ll enjoy views of the Smoky Mountains and the Smoky Mountain trees from every angle inside Mountain Time. If it’s rainy outside and you’re looking for something fun to do, head on over to the Mountain Time theater room, where you can create your own movie-theater experience from the comfort of your Pigeon Forge cabin! 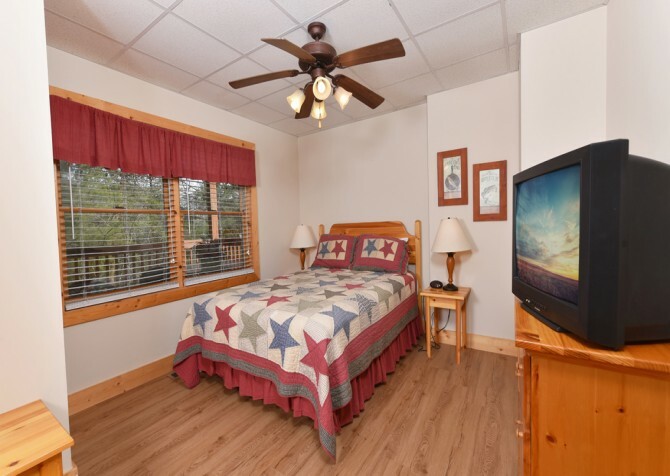 The huge flatscreen TV in the space provides the perfect place to watch your favorite movies, and Mountain Time provides you with a Blu-ray player, DVD player, and VCR to watch them on. 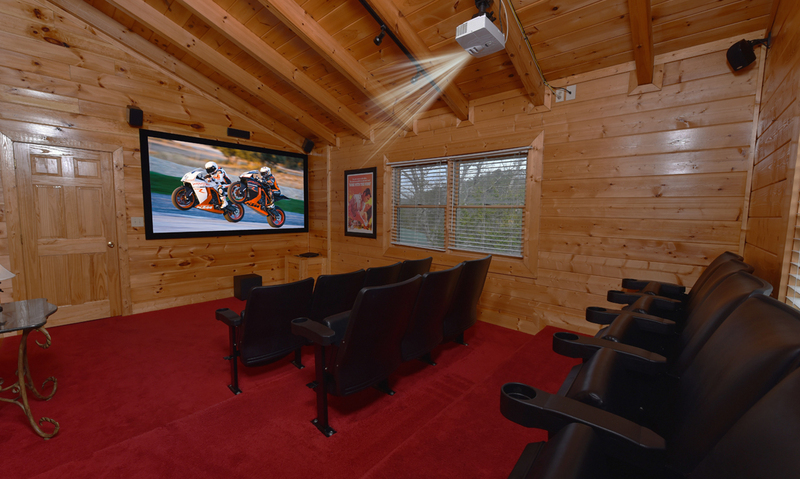 Enjoy 12 theater-style seats with individual cup holders, making it feel just like you’re in the theaters when you draw the blinds and cozy up with family and friends. 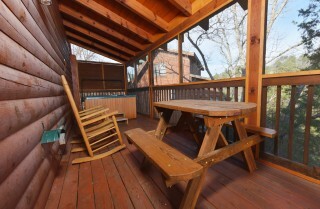 You’ll even find a small side table where you can set a big bowl of popcorn or your favorite selection of candy. 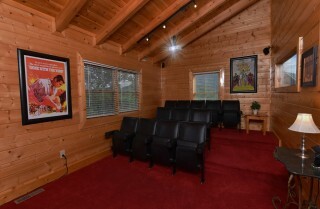 However you use it, Mountain Time’s theater room is sure to be a favorite place for your group to retreat while you’re in Pigeon Forge! 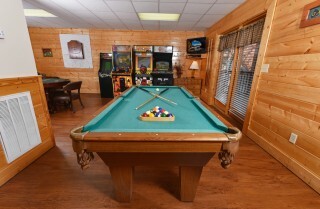 Another fun space to enjoy on a rainy day or evenings after you return from downtown is Mountain Time’s rec room. 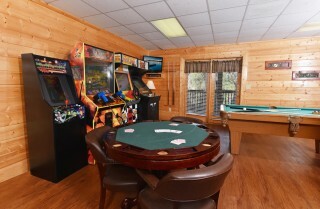 This large gaming space comes with all the fun amenities your group will hope to find in a Pigeon Forge getaway. Enjoy a pool table and dart board, as well as a selection of arcade games. There’s also a card table that you can use for a poker tournament with your friends and a mounted flatscreen in the corner that will play your favorite movies or shows in the background while you play. The large couch in the rec room is perfect for guests hoping to sit down and relax between shots, and if that’s not enough, you’ll also have direct access to a Mountain Time porch from this space. 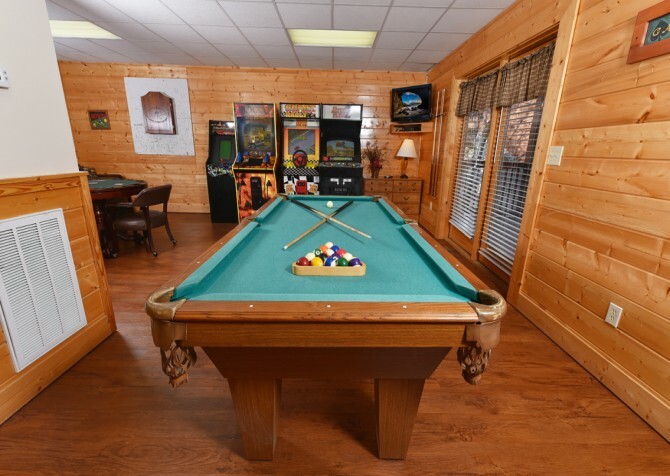 Get your group together for a fun time of games, games, and more games in the Mountain Time rec room! 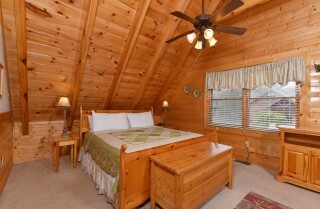 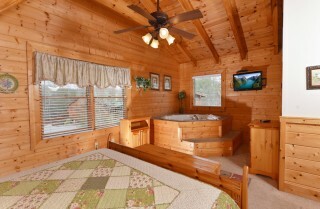 The cozy interior of Mountain Time extends to the 5 bedrooms and 5 bathrooms found in this cabin. 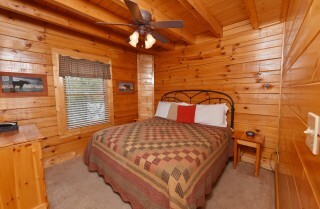 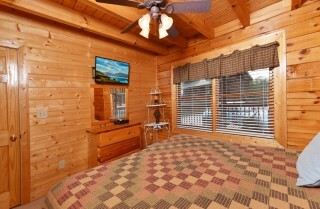 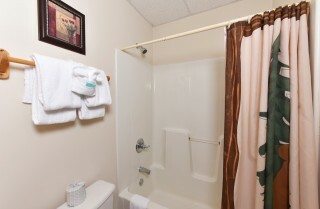 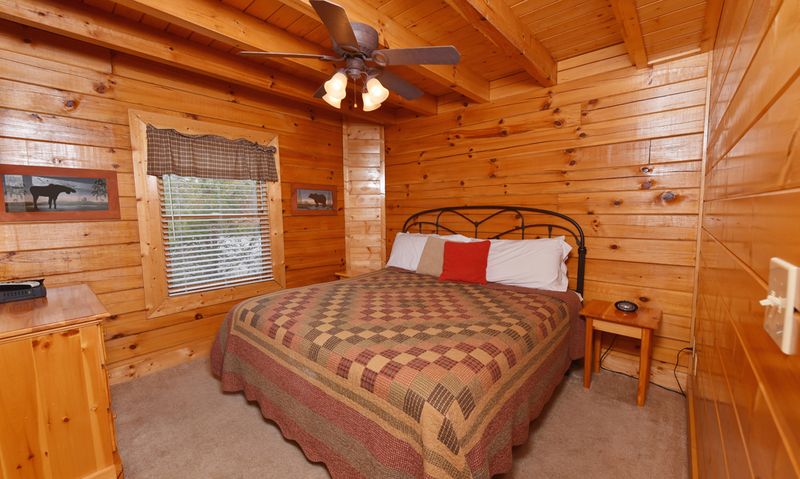 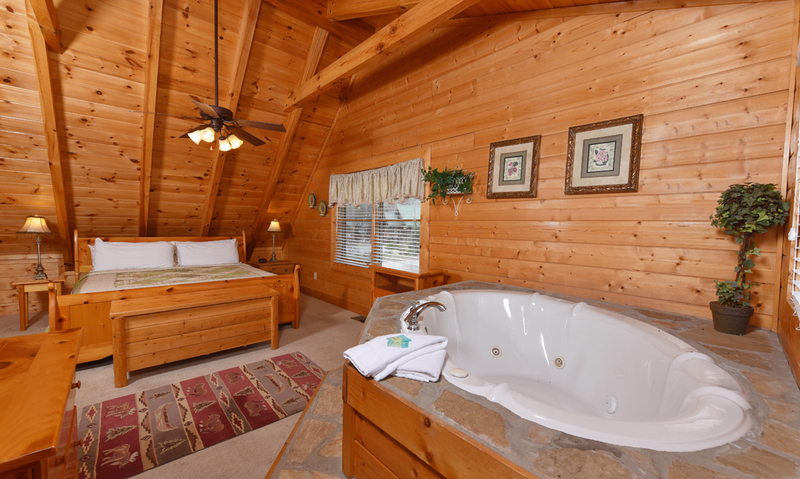 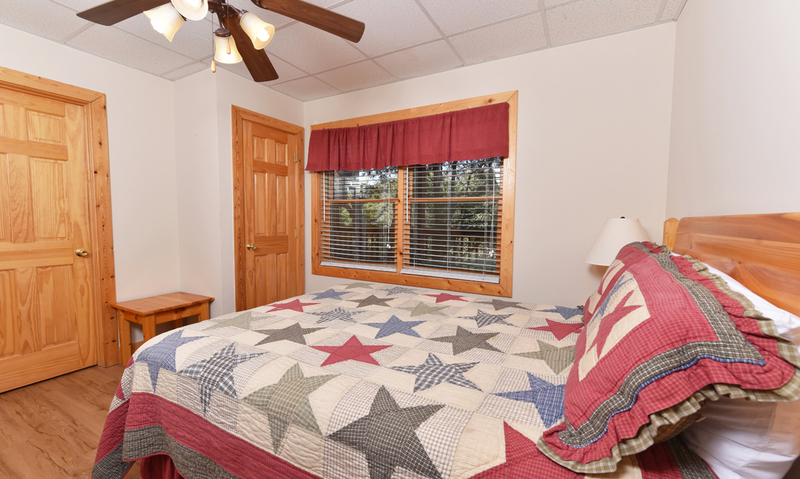 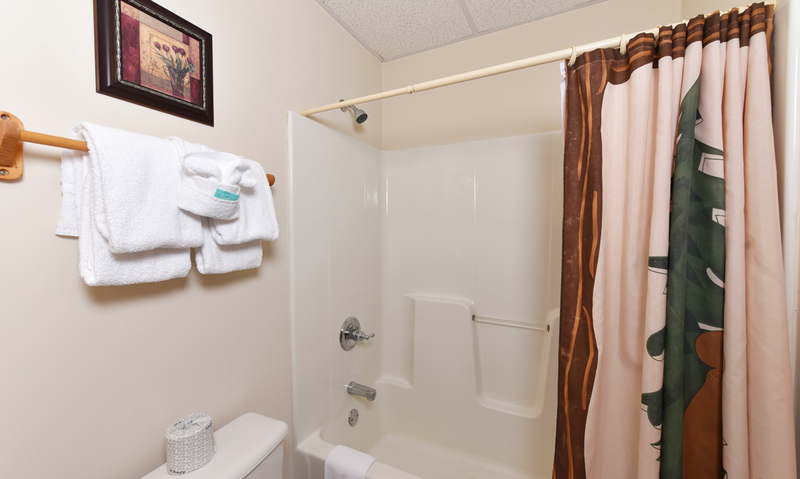 Total, you can comfortably accommodate 16 guests during your Pigeon Forge getaway. Enjoy new bedding, 3 king-size beds, 1 queen-size bed, 2 twin bunks, and 2 sleeper sofas for your group. Each bedroom provides the individual couples and families a private place to unwind and a comfortable place to sleep. The master bedroom comes with a little something extra—a large, indoor jetted tub! 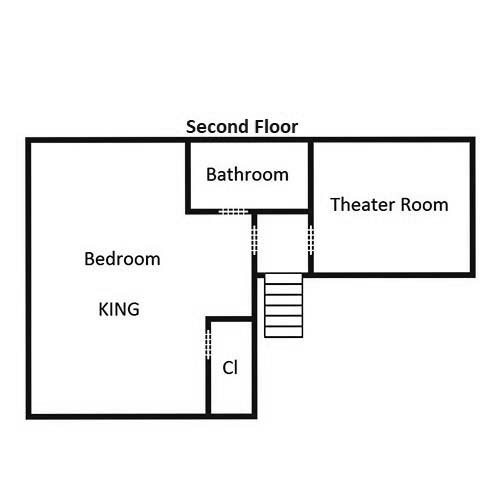 But each bedroom is exceptionally furnished with all the comforts of home, from ceiling fans to bureaus to reading lamps. Besides all this, enjoy private views of the Smoky Mountains from your very own bedroom with the multiple windows found throughout Mountain Time. 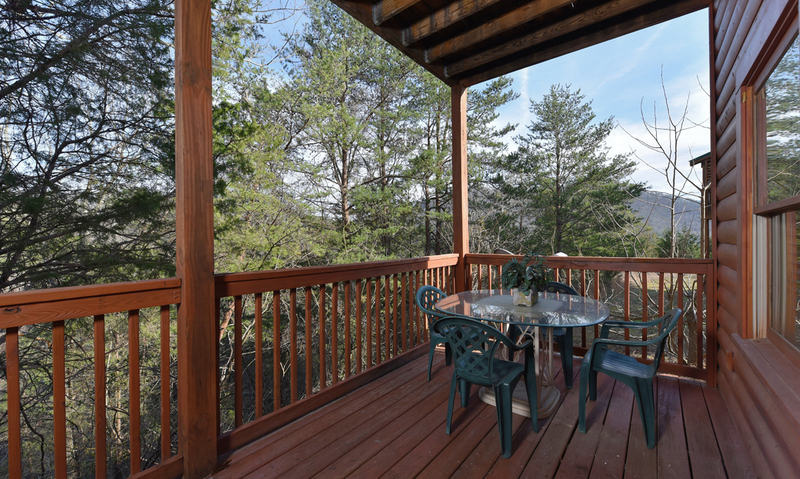 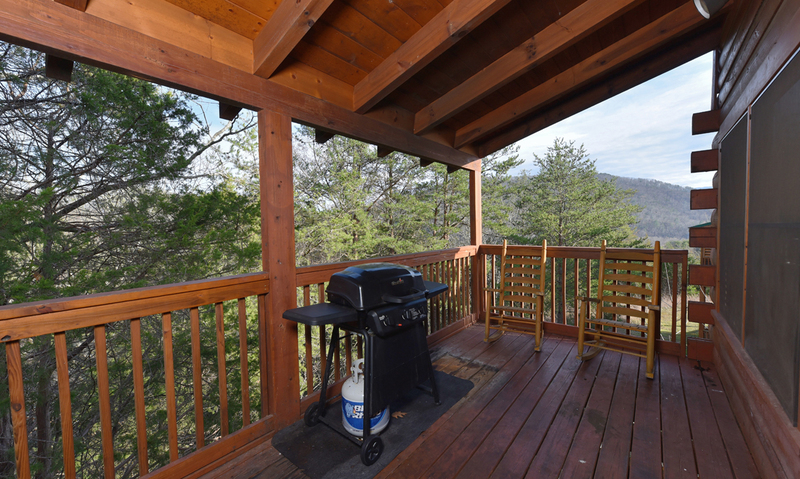 To truly enjoy the ambiance of the Smoky Mountains that surrounds this Pigeon Forge cabin, step onto the multiple deck spaces of Mountain Time. You’ll find a variety of seating options, including padded deck chairs, a collection of rocking chairs, and even a porch swing where you can sip your favorite flavor of Smoky Mountain wine and soak in the sights of the Smokies all around you. 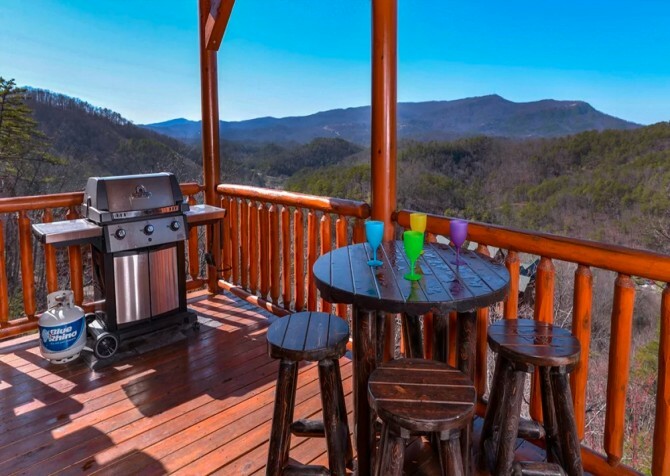 There’s also an outdoor dining area with a glass-top table and 4 chairs—the perfect place to eat fresh-made burgers straight off your gas grill. Plan for a family cookout or barbecue night while you’re at Mountain Time. 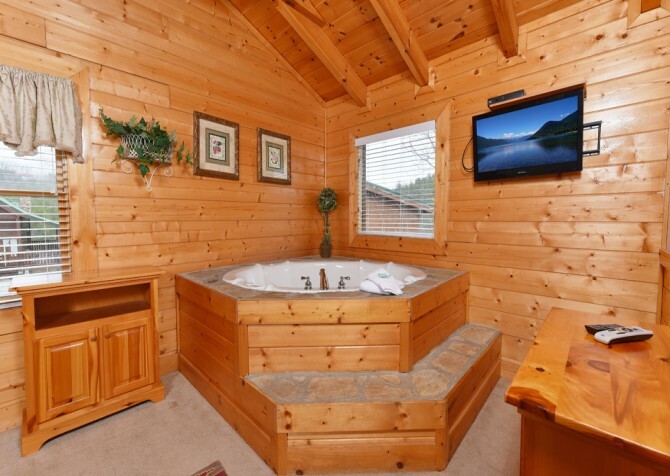 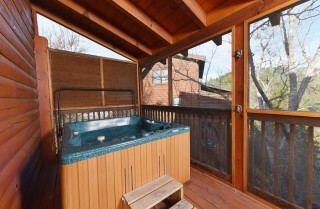 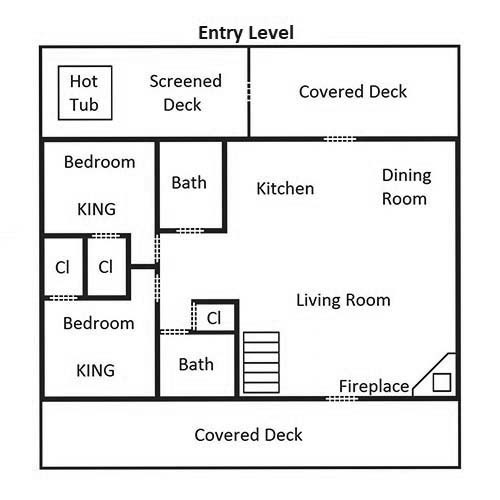 And when you’re done eating, enjoy a relaxing soak in your screened-in, outdoor hot tub that comes with this cabin. 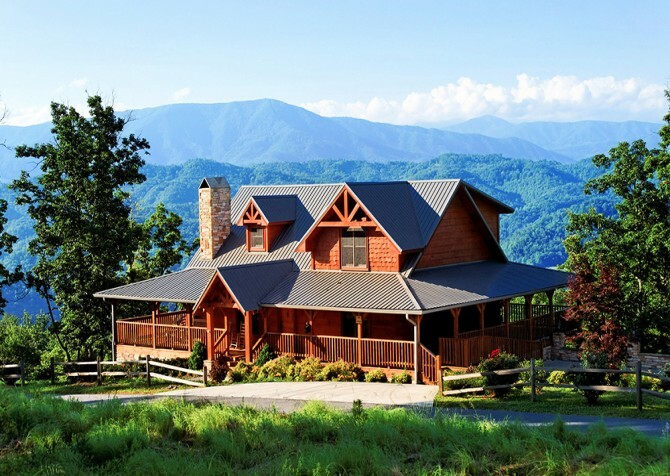 There’s no better way to relax in the Pigeon Forge than surrounded by friends and family in the beauty of the Great Smoky Mountains. 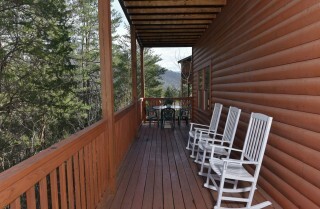 Mountain Time is easily accessible with its flat, paved driveway. 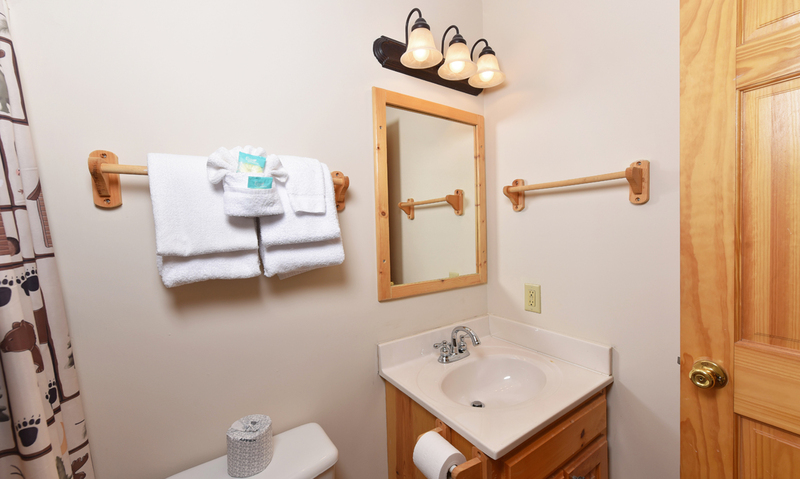 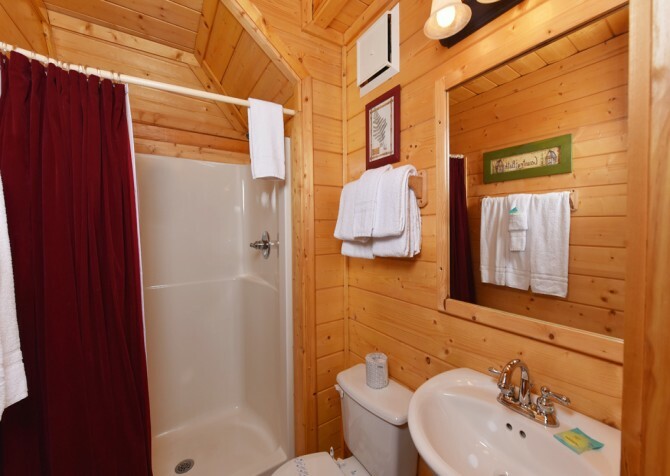 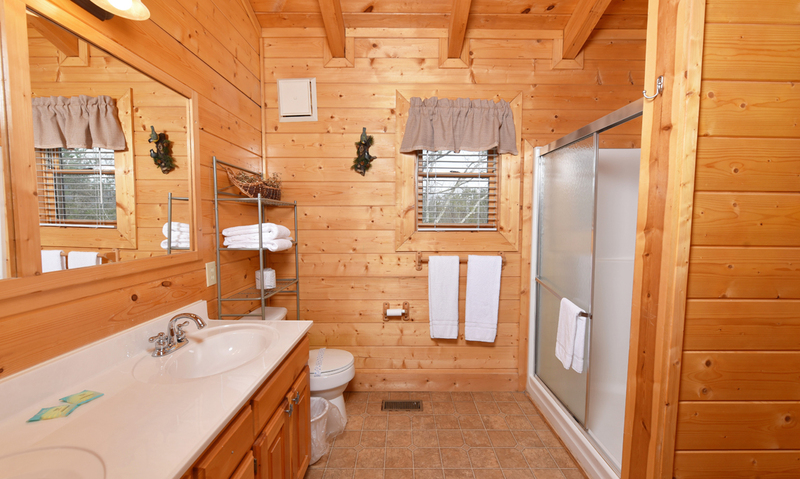 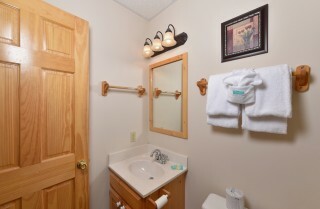 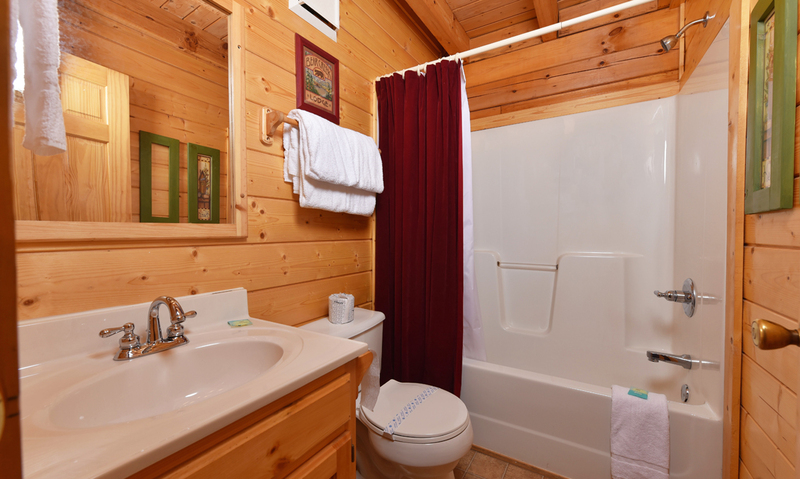 Other convenient amenities included with this cabin are high speed Wi-Fi, and a washer/dryer. With shops, rides, live music, restaurants, and more, The Island in Pigeon Forge is a great place to spend the day with everyone in your group. There are activities for kids and adults and plenty to keep you busy for a full day of fun! 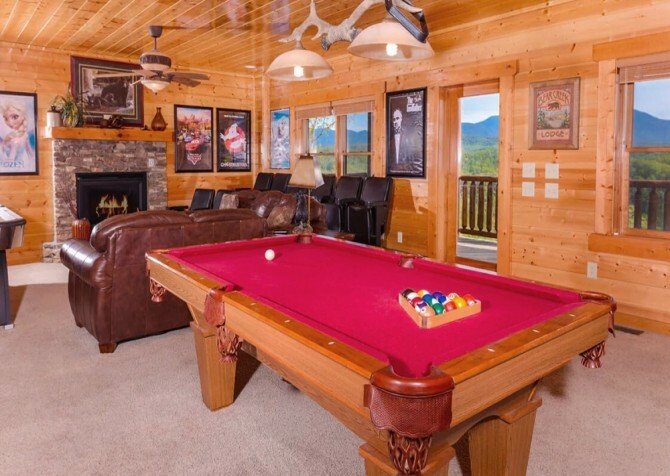 One of the more unique dinner shows in Pigeon Forge is the Lumberjack Feud, where you can witness ESPN lumberjack athletes at their finest. 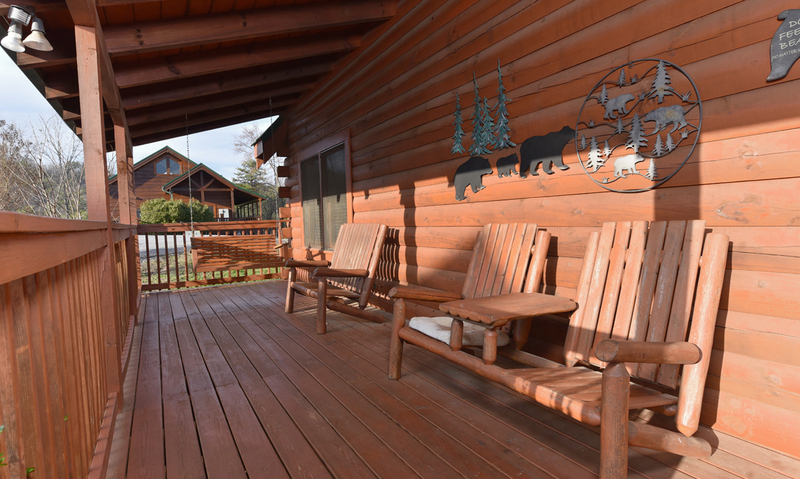 Axe swinging, tree climbing, and dog jumping are just a few of the exciting activities in store for the night! 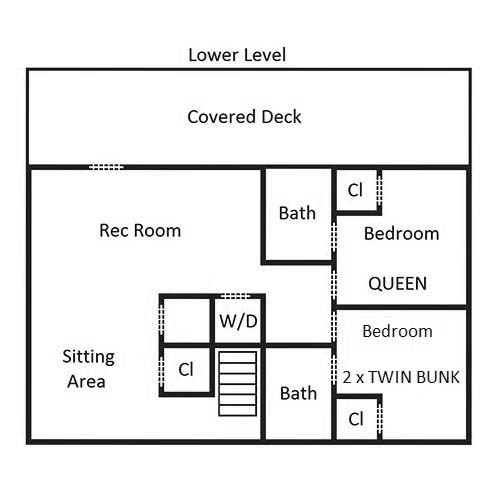 If you’ve got kids and/or teenagers in your group (or adults who still like to play with the kids! 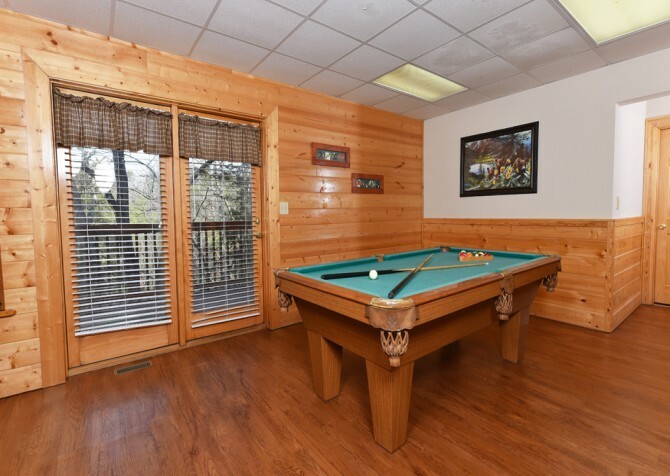 ), then head on over to LazerPort Fun Center, where you can ride go karts, play laser tag, test your swing in an 18-hole blacklight mini golf course, and so much more! 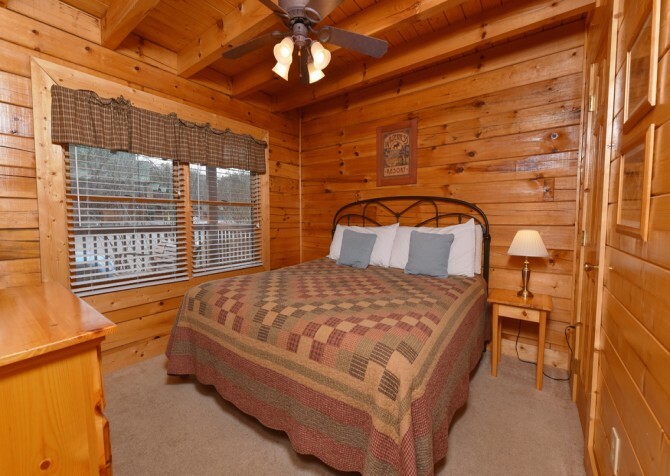 "We stayed at Mountain Time, a 5 bedroom cabin, and it was wonderful. The indoor movie theater and arcade were awesome!"